So you may have heard us talk a-lot about Test Town, the entrepreneurial competition where young businesses get a chance to try out their business idea in their town centre. Well since winning the Perth heat, Carnegie Trust UK has been slowly teasing us with information about the Grand final. We are delighted to reveal that the Grand final will be very grand, and luckily for us, will be taking place in GLASGOW! We are so happy that we will be able to promote Adventure Circus in Scotland and create some fantastic contacts and hopefully new circus lovers within the big city where circus all began for us. Since the announcement of the Test Town final, there has been a wave of media hype with both the Daily Record, and the Mail on Sunday calling to interview us and paying photographers to come and take our picture both teaching and posing, ah it's a hard life! It is particularly exciting that we will be featured this Sunday in the financial section of the Mail on Sunday (a UK national paper) to show that we are also serious about building the business of Adventure Circus, and that by winning the £10,000 investment we will be significantly ahead of our business plan targets at this stage in our development. Since the Perth final, we have been very fortunate to have increased interest in our classes and private workshop bookings, and we recently invited some of our most active and supportive class participants and fellow instructors to attend a planning session to scope out our vision, mission and values. We brainstormed for almost 5 hours, evaluating our progress to date and thinking up great ideas for where we want to be in a year, but also in five and 10 years time. 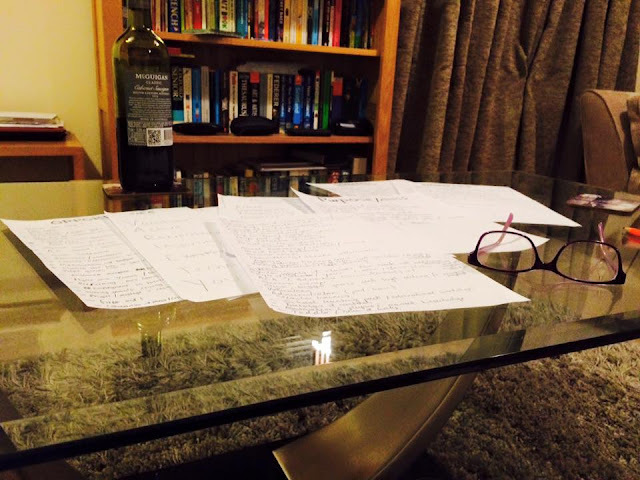 Lots of planning and only a little bit of wine! We have also been busy planning what we want to do as part of the Test Town Grand Final, but we can't reveal that yet, but make sure you keep the weekend of 26 and 27 February in your diary free! We are so grateful to the support we have received as part of this process, especially from Perth and Kinross council for supporting the TT programme, our wonderful participants, parents and our friends and families. Thank you! * Cooke family had taken the circus concept, at one time regarded as low-level entertainment, and brought it to new heights of popularity by introducing the likes of comics, vocalists and skilled trapeze artists to the stage. What a clever man!